Uranium Backup Support Forum - View topic - Versioning? a) could implement 'versioning', the ability to store different versions of a single file in a dedicated folder inside the destination. This is very useful for logs that keep changing over time and must be kept for future references. I couldn't find an option for this on Options/General Options/Direct Copy/. Only the "Never overwrite the destination file", but then the files that are updated in the source side are never transferred to the destination. The other options you have available there are also of no use for this – overwriting the file kills the purpose of having multiple historical versions. 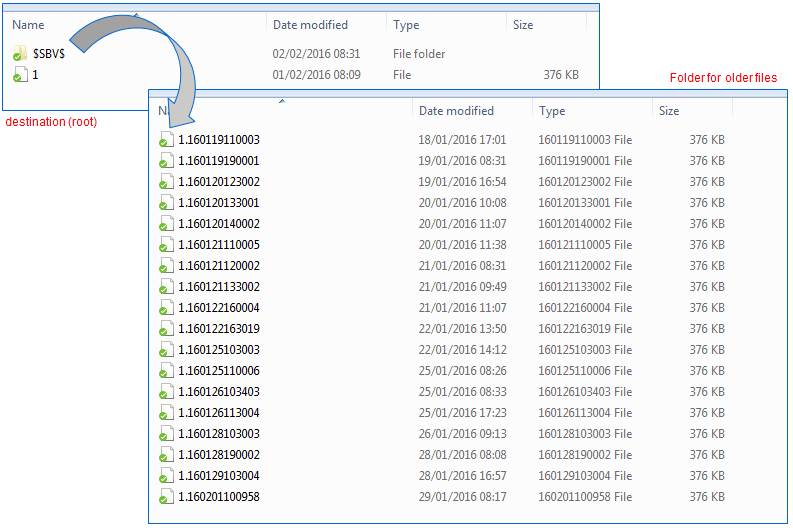 Some other commercial backup softwares offer this option, usually by creating a secondary folder inside the destination, keeping the newest copy at the destination root and automatically transferring their old versions to this "archive" folder. See the image below for reference. I hope this can be implemented also in Uranium Backup. We suggest to test the new incremental/differential backup mode we introduced with Uranium Backup 9. The restore let you browse previous versions of each file, basically you can choose a given restore point and recover the data.